Rather than Central Government directly funding infrastructure works like schools or hospitals, Private Finance Initiative (PFI) means a consortium of private sector banks and construction firms finance, own, operate and lease them back to the UK taxpayer, over a period of 30-35 years. PFI financing of public infrastructure is now in use across the NHS, as well as the Departments for Education, Local Government, Defence, Transport, and Justice. 2. How much PFI debt do we owe? UK taxpayers now owe £305 billion in PFI repayments across 700+ projects for the next 30 years. 3. Do PFI deals provide value for money? PFI deals have been universally criticised as horrendous value for taxpayers, likened to “paying for a hospital on your credit card” by BBC Panorama. PFI is significantly more expensive than Government funded projects with the cost of borrowing at least two times higher than Government financed works according to a 2011 HM Treasury Report. 4. Who is to blame for PFI? Private Finance Initiative (PFI) schemes were introduced to the UK under the John Major Government in the 1990s, with the first PFI project [Skye Bridge] tested in Scotland. Despite frequently calling for an end to "Labours flawed PFI program" whilst in opposition, in 2011 Chancellor George Osborne rebranded and continued the PFI gravy train under the "PFI 2" banner. 5. What impact is PFI having on the NHS? NHS Trusts owe £80bn in PFI loan repayments and “unitary charges,” the technical term describing the extortionate ongoing running costs of maintainingPFI hospitals via PFI - where private contractors are granted 30-year monopoly rights to deliver maintenance and services. Next year alone, NHS Trusts will make some £2bn in PFI repayments - but the issue was conveniently ignored by the NHS England 5 year plan. The number of NHS Trusts in financial trouble has doubled in the last financial year. 6. What can we do about PFI? A public movement is building to fight back against the PFI scam. 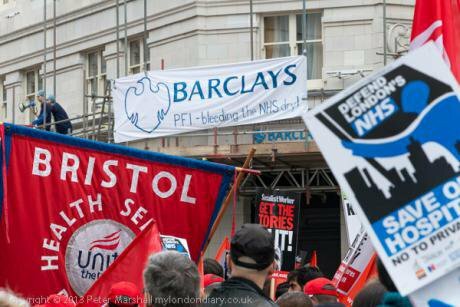 At The People vs PFI Conference this month at the London School of Hygiene and Tropical Medicine, activists, professionals and academics came together to call for an end to the madness of PFI. Practical examples abounded. Dexter Whitfield discussed the PFI project across Europe and highlighted the need for movement building to oppose it. David Price set out the sorry history of PFI in the NHS, and Stuart Hodkinson explained why PFI is no answer to housing problems in Lambeth and Islington. Ann Pettifor set out how solutions must also address the issue of money creation and capital controls. Nick Hildyard explained how PFI (also known as PPP) is a key tool of neoliberal capitalism, being used globally to extract finance, and Ashley Seagar highlighted how PFI damages ‘intergenerational fairness’. The conference also focused on finding ways of organising locally to demand solutions to PFI. Participants heard how to get stories into the media, research the dodgy deals, follow the money and build a movement, with workshops led by experts from Focus E15 mums, UK Uncut, Spinwatch, World Development Movement and others. Check out the Storify and follow us on Twitter for more - @PplVsPFI and #PplVsPFI . 7. Who is listening on PFI? The question remains, who within our political establishment is listening? Shadow Chancellor Ed Balls said this weekend that ‘only Labour can save the NHS and deliver a recovery that works for all’. Labour have also pledged to solve the affordable housing crisis. But in his Labour Party conference speech this year, Balls promised: “no proposals for any new spending paid for by additional borrowing". So where’s finance for investment in hospitals, housing and other infrastructure to come from? If not from traditional government borrowing, the suspicion must be that the Labour party, under Ed Balls economic stewardship, would instead continue to spend via the taxpayer-funded, off balance sheet, rip-off PFI credit card. People vs PFI called up Shadow Health Secretary Andy Burnham for clarification on the Labour party line ahead of our PFI conference a couple of weeks back. Would Burnham commit to no new PFI deals in the NHS, we asked? So People vs PFI called up Ed Balls. His office declined to even comment. Hardly the stuff that inspires confidence in Labour’s commitment to saving the NHS! Continuing PFI costs the taxpayer much more over the long term. It allows private financiers and construction firms to make a killing out of public infrastructure, privately owned via offshore tax havens. It captures fewer benefits captured locally in the form of tax receipts and wage growth. And it ensures our public services are non-transparent, unaccountable to local citizens, and set up to fail for future full privatisation. It’s absurd for the Labour party to claim fiscal responsibility with one hand, and to propose more PFI with the other. Ed Balls should make a radical departure from Labour’s failed PFI experiment, and admit publicly that Government financing of infrastructure is always cheaper than private sector finance.